Here’s a recipe you’re going to memorize. And I’m not saying that because it’s so simple. 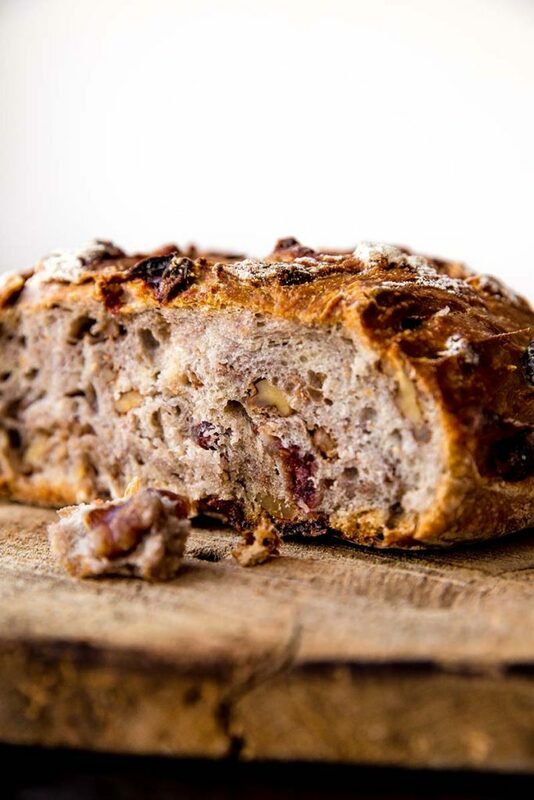 I’m saying it because it’s an unbelievably and awesomely delicious homemade bread with a major crust, a soft and chewy texture, and plenty of irresistible nuts and dried cranberries to keep each piece interesting and unique. You won’t be able to stop making it. You won’t be able to stop eating it. And, as such, you’ll memorize it before the year’s over. I’ve made this no-knead bread 4x within 2 weeks and I’m not even a bread person. But it MADE ME A BREAD PERSON. Not sure if that’s a bad thing? “Homemade bread” and “easy” are terms that don’t typically go hand-in-hand. 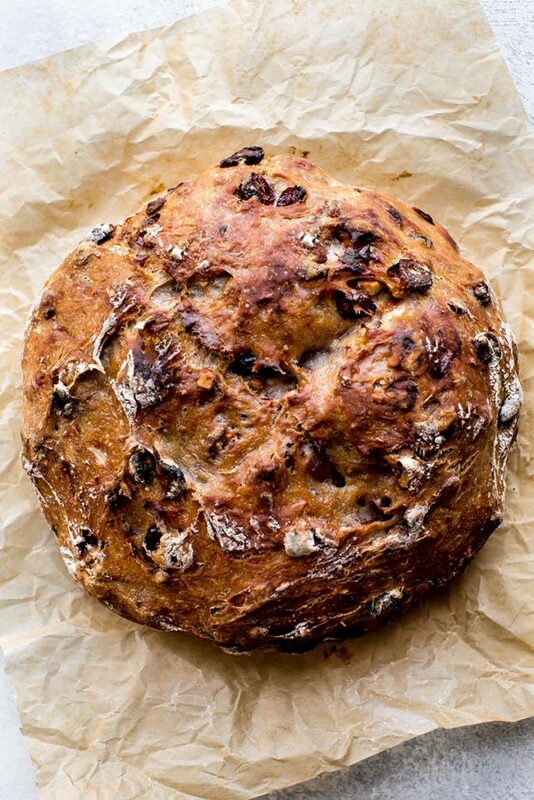 When you think of homemade bread, you get pretty freaked out, right? Seems like a terrible idea, majorly complicated, and a general waste of time. No thanks. This recipe will completely change that universal thought. This bread’s got all the bells and whistles and takes zero effort to make. You’ll need some basics like flour, salt, and honey. You’ll also need a little warm water to bring all the ingredients together and activate the yeast. For the yeast, we’re using Red Star Platinum, my favorite. Don’t be nervous– yeast doesn’t bite, I promise. 🙂 It’s just another ingredient you’re adding. Red Star Platinum definitely works its magic in this bread. 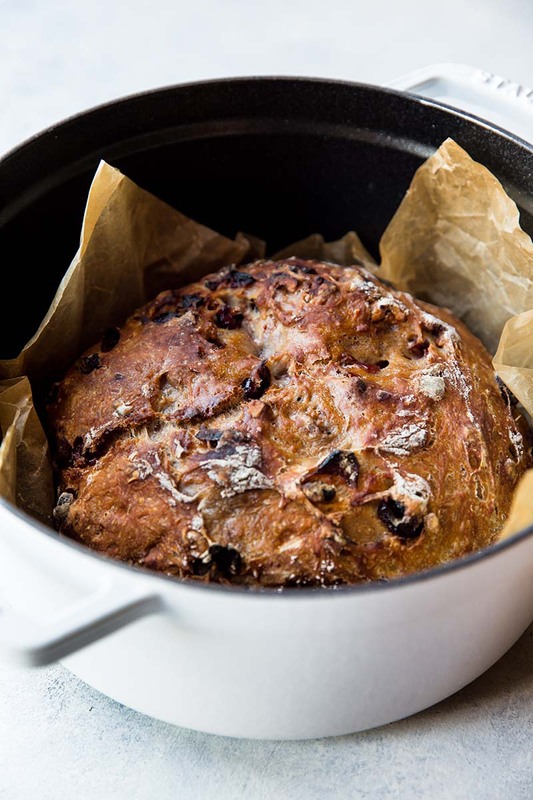 You’ll bake the bread in a super hot 6-qt Dutch oven. If you don’t have one, you can use any heavy duty pot with a lid, providing it’s oven-proof. Baking the bread with the lid on traps steam inside the pot, creating that perfect crust. It’s so easy, you’ll be silly not to try it. And you’ll really be missing out! Step 1. Stir the first 6 ingredients together in a large bowl. Stir in the warm water. The dough will be pretty sticky-- don't be tempted to add more flour-- you want a sticky dough. Gently shape into a ball as best you can. Cover tightly with plastic wrap or aluminum foil. Set on the counter at room temperature (honestly any normal room temperature is fine!) and allow to rise for 12-18 hours. The dough will double in size, stick to the sides of the bowl, and be covered in air bubbles. Step 3. Using a very sharp knife, gently score an X into the top. Cover dough lightly with plastic wrap and leave alone for 30 minutes. Step 4. During this 30 minutes, preheat the oven to 475°F (246°C). (Yes, very hot!) Place your dutch oven (with the lid) or heavy duty pot inside for 30 minutes so that it's extremely hot before the dough is placed inside. After 30 minutes, remove the dutch oven from the oven and carefully place the dough inside by lifting it up with the parchment paper and sticking it all-- the parchment paper included-- inside the pot. Cover with the lid. Step 5. Bake for 25 minutes with the lid on. Carefully remove the lid and continue baking for 8-10 more minutes until the bread is golden brown. Remove pot from the oven, carefully remove the bread from the pot, and allow to cool on the counter for 30 minutes before breaking/slicing/serving. Step 6. 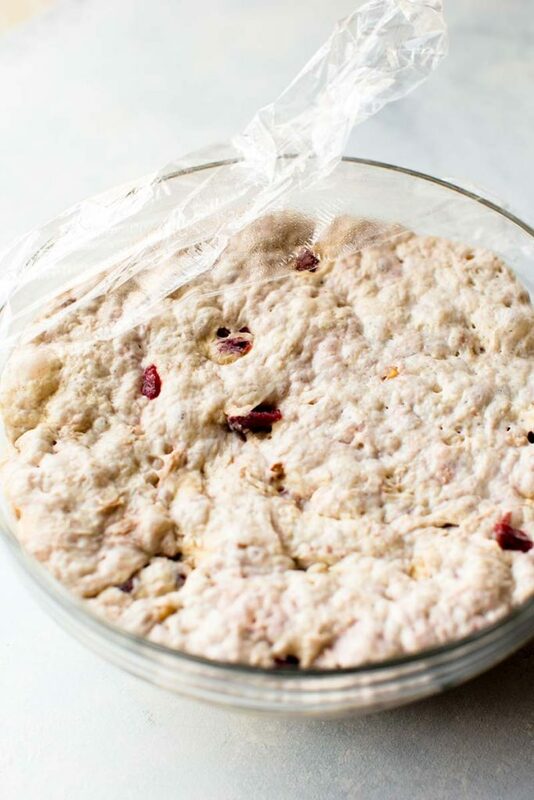 Cover and store leftover bread at room temperature for 1 week. Make ahead tip/Freezing: The dough takes up to 18 hours to rise, so this is a wonderful recipe to begin 1 day ahead of time. You can also bake the bread, allow it to cool, and freeze for up to 3 months. Thaw in the refrigerator and allow to come to room temperature before serving. You can also freeze the dough. Complete the recipe through step 2. Wrap in plastic wrap and place in a freezer-friendly container. To bake, allow dough to thaw overnight in the refrigerator, or for 2-3 hours at room temperature. Continue with step 3 and the rest of the recipe instructions. Can the second rising be in a Benetton proofing basket? Will the rings show? Yes, you can rise in a Benetton proofing basket. The rings may show after baking. I made this bread this week. It is wonderful. I have one question though. It turned a pinkish-purple color. Assuming it was from the cranberries. It tastes great. Just wondering if anyone else had this happen and/or if there is a way to avoid this happening. I’m glad you enjoyed the bread! 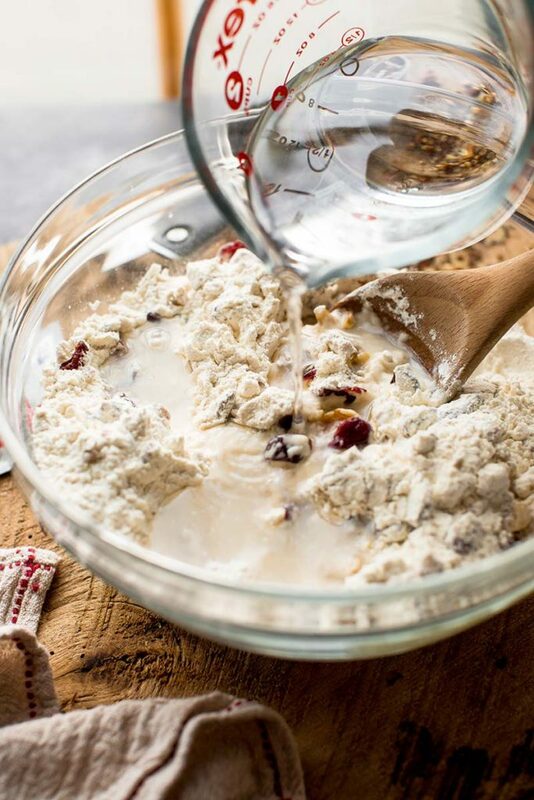 You can try coating the dried cranberries in flour before adding to the other dry ingredients. Let us know if that helps! I’ve never found parchment paper that will withstand 475 degrees in the oven. The best I have found is unbleached and tolerant up to 450. What brand do you use that will be safe at 475? I use Kirkland (Costco brand) parchment paper when cooking pizzas at home in a 500 degree oven, and it works fine. King Arthur Flour also sells parchment paper, and it states that it is good up to 500 degrees. Let us know if you find any other sources. I checked the Costco Kirkland brand and it states “up to 420”. Mine is “Beyond Gourmet”, which I got on Amazon, and it states up to 450. It is my opinion that I can make this delicious sounding bread safely with my parchment paper. I get mine from King Arthur. 1. Have the blue label Rapid Rise on hand as it is my standard yeast. Can I use this in place of the Platinum and how to substitute? 2. Any thoughts of a longer refrigerator rise instead of the room temp rise? 3. Always cautious about the preheated dutch oven method. Any suggestions on using the dutch oven at room temp rather than preheated? 1. Yes, substitute at the same level. Use ½ tsp Quick Rise as called for in the recipe. 2. For proper dough development and full flavor development, 18 hours at room temperature is best. 3. To get the crusty crust, a preheated dutch oven is essential. Thanks for the response. Very helpful. Response prompted another question. Some recipes call of an overnight rise in the refrigerator for additional flavor. Is there any general rule about what lean, yeast bread recipes will or will not benefit from the overnight, cold rise? Great website. Always watch for new things to try. Any ‘kneaded’ (or something similar to the Artisan Bread in Five Minutes a Day method) dough can be refrigerated: https://redstaryeast.com/yeast-baking-lessons/postpone-baking/. With this particular recipe, due to the low yeast level, we still recommend following the room temperature overnight rise directions. Hi, can I use a 9 quart Dutch oven? Ideally a 6-qt Dutch oven would work best, but you could use the larger size. The dough may spread out more than rise up, but should still produce a great tasting loaf! Can I use Red Star Bread Yeast for this recipe instead of the Platinum Yeast? I would like to make it in the next few days, without making a special trip to the store. Yes, you can use 1/2 teaspoon of Quick Rise Yeast in this recipe. 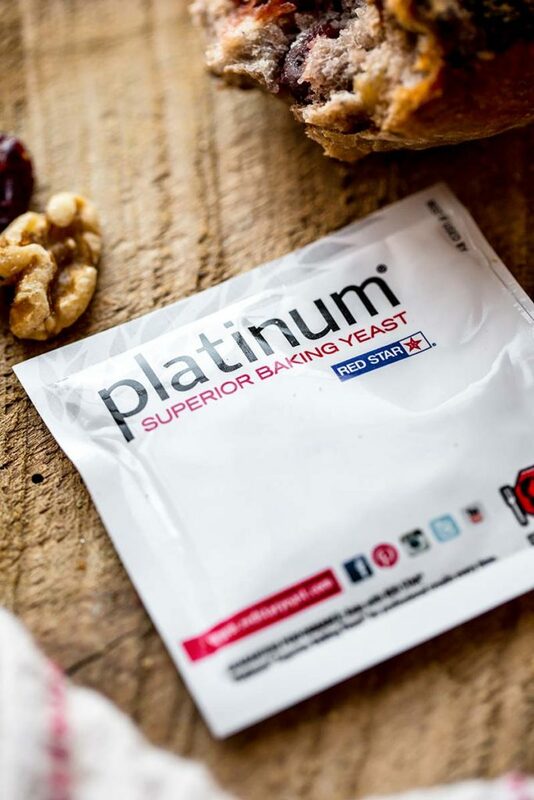 I see the recipe only calls for ½ teaspoon Red Star Platinum Superior Baking Yeast. That doesn’t sound like much. Is that because of the long bull rise? I’m wanting to make a 4 1/2 cup recipe. I’m thinking that I will need about 8-9 grams of instant yeast. Yes, the long rise allows for less yeast. The recipe uses 3+ cups of flour. If you are adjusting the recipe to 4 1/2 cups of flour, I would recommend using 1 teaspoon of yeast. I just saw your recipe on Facebook and immediately went and threw it together… will throw it in the oven tomorrow. I use the liner of a 1-1/2 qt slow cooker as a pan for my no knead bread, hope that will hold it! Can’t wait to try it. Best bread ever, followed your recipe yo a T! The results were delicious. Almost ate the whole thing, but gave half to our neighbors while still warm. I am a big fan of simple bread dishes like this and any variations of No – knead types of bread. Can you use Bread Flour in place of the All purpose Flour?? Yes, you can substitute bread flour for the all-purpose flour. You may need to add a bit more water due to the higher protein content of the bread flour. I would love to make small pull-a-part rolls. Is that possible using this recipe? I usually by them from the Brooklyn Bakery, but they always run out. I don’t see why not! Let us know how they turn out. Could you use a 5.5 qt dutch oven? Yes, that size would work. Let us know if you make the recipe!